Blogathon 2 Here I Come! 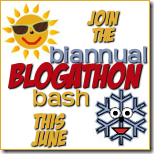 Kathleen Garber is running another Blogathon starting today. I’m planning on taking part as much as I can over the next three days whilst still enjoying my life! The suggestion is to aim for 24 TOTAL but NOT consecutive hours of blogging tasks but I can’t imagine I will get anywhere close to that. Last time I managed a total of 5 hours 30 mins. Mini challenges will be available during the weekend. You’re free to choose which ones you want to do and do them when you can. You get a chance to win prizes and the more you do, the better your chance to win. You can read about it and/or join in here. 24. Change home page to split into 2 columns after first post? To be honest a number of those things leave me cold but maybe the energy of the group will inspire me to get on with them. We’ll see. There’s plenty of stuff there that I’ll enjoy doing anyway. Not to mention the mini challenges which I’m sure I’ll have a go at. It all depends what else we get up to this weekend. If you fancy joining in let me know and we can maybe encourage each other. It’s well worth doing as, even if you don’t get stuff done during the challenge itself, it seems to magically get done later. At least that was my experience in the January Blogathon. I had 5 things on my list and only completed one during the challenge. The others I’ve done since without even thinking about them. And the one that isn’t done I no longer feel is important. Add to that the fact that I completed loads of stuff that wasn’t on my list and you’ll see that it’s definitely worth doing. This time I’m going to get myself sorted with Twitter and attend a Twitter party (whatever that is). I’m anticipating that it will be even more fun, being in closer contact with others doing their own things. If you’re even slightly tempted, even if you can only manage an hour or so, do join in. It’ll be fun! Good luck with your list; I see that you are in it to win it! I have some much needed house cleaning tasks on my lists and I really hope to accomplish them, and to participate in some mini challenges geared toward those goals. Happy blogging! Thanks Elizabeth. I’m not expecting to get many of the tasks done. I’m already tearing my hair out trying to get my head around Twitter and have retired to the coffee shop. But the internet connection keeps dropping. Grrrrrrr! No wonder I keep putting this stuff off. Will be good to crack it though. Good luck with the cleaning! Always glad to help. Could give you a few more should you find yourself with time on your hands. Ha, ha! Tried to leave a comment on your blog but couldn’t because I don’t have a Wordress.com account! Re: #21. I see your site uses WordPress. I also show summaries on my home page, but that has nothing to do with what shows up in your feed. When logged in to WordPress, if you go to Settings > Reading, there is an option that says “For each article in a feed, show” and then you can pick Full Text or Summary. You want it to be set to Full Text. You can also visit your feed yourself to see what it is returning. Actually, I just clicked on your feed and it’s showing full text, so I think you’re OK. But still good to know how to change it. That’s a great list and I also need to accomplish a few of the tasks you have on yours. I don’t seem to be doing very well with my list but I am having a great time socializing and getting to know some new people! Hope you are having fun and crossing many items off your list. I’m having a great time too. Just got back from a walk on the cliffs with some visiting relatives. Thought I’d try and grab another hour while they’re napping and before we go out to dinner. I’ve already passed the hours spent total from last time. I’m very pleased! Glad you’re enjoying the socializing. P.S. Thanks for adding to my list. Lol!